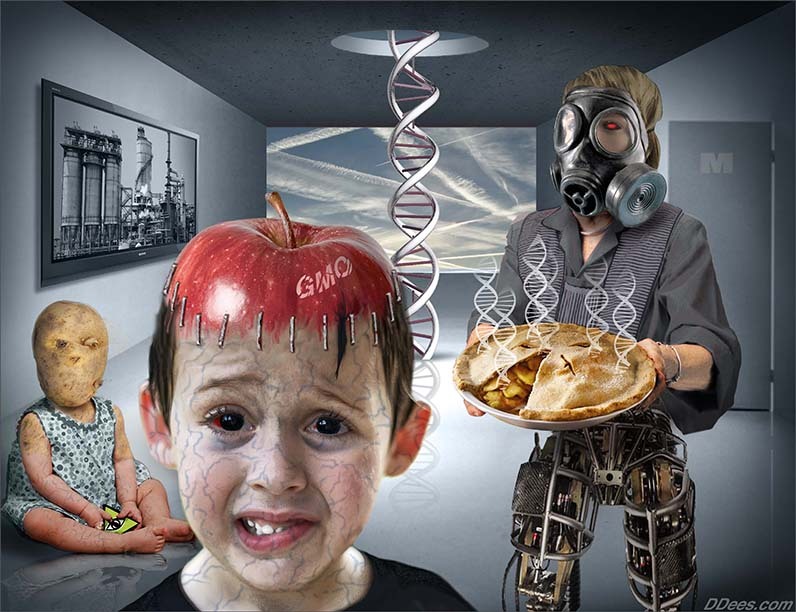 Natural health expert and Mercola.com founder Dr. Joseph Mercola interviews Dr. Lucija Tomljenovic on how vaccine adjuvants affect your brain. Read much more at Garda$ell: Snake Oil With A Bite | GreenMedInfo | Blog Entry. If it appears that madmen have taken over the asylum, it might be because it is true. It is not we common people who are creating problems with the weather; it is the big corporations and nations. It is as if the boys in charge are naughty little children whose parents never taught them how to play nice. Send them all to Mars before they destroy this beautiful planet and kill all its beautiful inhabitants. Read more at Tech Giants Poised to Bath Earth in Microwave Radiation « Memory Hole. The bottom line is that ECT “works” to the extent that it damages and disables the brain. …. Human and Experimental Toxicology 2011 Sep;30(9):1420-8. Correlation does not equal causality of course, but it’s hard to think of other possible causal mechanisms here aside from the obvious one, the number of vaccinations given before 1 year, which are widely acknowledged to be worthless to an immature immune system btw. One would think that an increasing number of vaccinations would correlate with other increasing positive measures of medical care which would tend to lower the IMR. Apparently vaccines are not the manna from heaven that they’re marketed to be. What else does vaccine “science” have wrong? 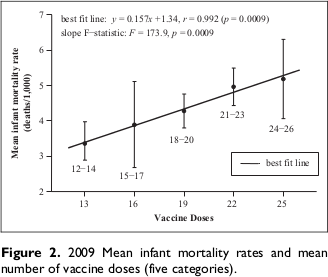 Note that there’s no hint of an “ideal” number of vaccinations below which the IMR rises as the vaccinations decrease. The relationship appears to be linear. 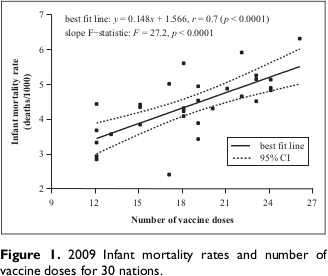 The implication is that ANY vaccinations before the age of 1 year increase the probability of death. Given that infants’ immune systems are too immature to make sense of vaccines (breast milk is immunization for a baby) it’s difficult to see how any knowledgeable physician could recommend vaccinating such children. Given all these theatrics it’s a fair bet that benghazi really was all about arming ISIS with weapons via libya, as so many have deduced. BTW: Wolf Blitzer tries to pull a fast one in the CNN clip above, where he states there’s no possibility of recovering the data. This is highly unlikely unless the hard disk was physically shredded. That’s why her lawyer is refusing to give the server to congress. Another ruse above is that wall street is warning the dems not to choose Elizabeth Warren, implying that she’s their enemy. Unfortunately she’s already abandoned her demands to audit the federal reserve and give student loans via the fed’s discount window. Is she being bribed, blackmailed or threatened? Perhaps her children have been threatened? In this country, at this time, absolutely anything is possible. The clip shows armed troops arresting role players on the street before a column of prisoners are marched towards a mock internment facility. Black Hawk helicopters are also seen whizzing between buildings. Concerns continue to circulate that such drills are designed for dual purpose and are part of a plan to acclimate Americans to accept martial law in a time of national emergency. As we have exhaustively documented, the fact that preparations are being made to use the military during domestic unrest is manifestly provable. Jade Helm, an upcoming military drill that will involve nine states, caused controversy after Texas and Utah were labeled “hostile” territory in documents related to the exercise. As we reported earlier this week, the exercise will involve soldiers operating “undetected amongst civilian populations,” to see if they can infiltrate without being noticed. When these sheep-in-wolves-clothing are marching to their orders, will it occur to them how strangely convenient their training was, just in time for the collapse of the economy? Real citizens aren’t afraid to think for themselves, whether in uniform or not.